A bay leaf is a fragrant leaf from a laurel tree that is used as an herb. Bay leaves can be used fresh or dried; dried bay leaves tend to have a slightly stronger flavor. Fresh bay leaves are shiny dark green on their tops with a duller, lighter green underside. When they're dried, they look pretty much the same on both sides. Bay leaves come from the bay laurel plant. Bay laurel is an evergreen shrub or plant that grows slowly and in warm climates. The bay laurel plants can be grown for ornamental uses, and the leaves can then be dried and used in cooking. 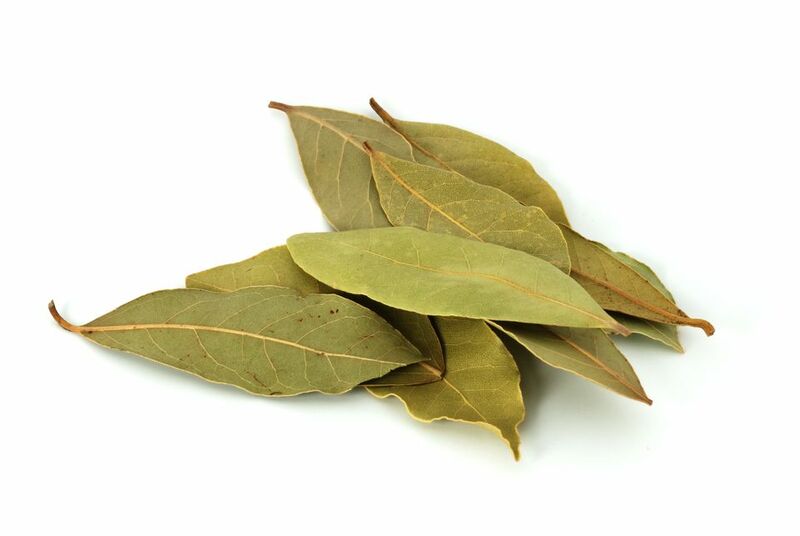 Bay leaves can be used in many types of cuisines. Most often, recipes call for dried bay leaves. While the flavor results of fresh vs. dried bay leaves are not that different, fresh bay leaves are often much more expensive and do not last as long as dried bay leaves. In addition to simmering them in soups and stews, bay leaves are great for stuffing into the cavity of a chicken before roasting it, and they can be added to the liquid for cooking rice. There's a misconception that bay leaves are poisonous. However, the bay leaves used for culinary purposes are not poisonous. There do happen to be a couple of species of bay leaf that are poisonous, specifically the cherry laurel and mountain laurel, but these varieties aren't sold as herbs. Bay leaves are removed before serving because the leaves have sharp points and can stab you in the mouth if you bite down on them the wrong way. Fresh bay leaves can be stored in a sealed ziptop bag and stored in the refrigerator. They can last for a week or two this way. Dried bay leaves can be stored in a cool, dry, and dark spice cabinet in a sealed container. Another option is to store the sealed, dried bay leaves in the freezer. This helps the bay leaf retain its flavor and floral potency. While bay leaves do not bring overwhelming and distinct flavors to any dish, they can be thought of as a "supporting actor," in that they help coax out other flavors and spices in whatever dish you are making.